Dave Taylor has been on the SFA's list of "Famous People Who Stutter" for many years, but probably few people know all of the unique accomplishments of this former hockey great who was born on December 4, 1955, in Levack, Ontario. Taylor worked many summers as a teenager in the nickel mines in his hometown of Levack. He was a good player in his youth and even once beat out Dale McCourt, a future first overall pick in the 1977 NHL draft, for a league scoring title. Taylor was viewed as too light to play in amateur hockey in Canada, so instead he took a scholarship to Clarkson College in Potsdam, New York in 1973. Unlike today, very few college players made it into the National Hockey League. Taylor set all the Clarkson scoring records and in his last year was named both an NCAA All-American and the ECAC player of the year. After his outstanding college career, Taylor was selected in the fifteenth round as the 210th player overall. In those days, someone selected in the fifteenth round never made it into the NHL. Some say his 150 pounds deemed him an unlikely pro prospect. Taylor proved them wrong as he not only earned a spot on the Kings, but had an outstanding rookie year in 1977-1978 with 22 goals and 21 assists. The next season Taylor would start playing on famed "riple Crown Line" with perennial superstar Marcel Dionne and top goal scorer Charlie Simmer. This trio tore up the NHL for a few years. The Kings became more popular in 1988 in the blockbuster trade that brought superstar Wayne Gretzky to the Kings. Taylor was definitely the link between the "old guard" of the Los Angeles Kings to the new "Gretzky era" of the franchise. 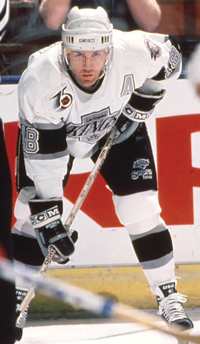 With Gretzky leading the way, the Kings made the Stanley Cup finals for the first time in franchise history during Taylor's sixteenth season with the club in 1993. In 1991, while still an active player, Taylor was honored with two awards by the National Hockey League, the Bill Masterson Memorial Trophy and the King Clancy Memorial Trophy. The Bill Masterson Memorial Trophy is awarded annually to the player who best exemplifies the qualities of perseverance, sportsmanship and dedication to hockey. The King Clancy Memorial Trophy is awarded annually to the player who best exemplifies leadership qualities on and off the ice and who has made a significant humanitarian contribution in his community. However, the year 1991 was most compelling in that on February 5 Taylor scored his 1,000 career point, putting him into an elite group of NHL players throughout history. Dave Taylor has always been open about his stuttering. He has admitted in public that he once had to drop a class in college when he found out that an oral presentation was required. Also, early in his NHL career Taylor when interviewed after games on the radio, Taylor would always fake hyperventilation to guide him to fluency. Taylor credits his triumph over stuttering to his work with famed SLP Vivian Sheehan in Los Angeles. Taylor's stuttering certainly did not hold him back after his retirement in 1994 as he served from 1997 - 2006 as the Kings' General Manager and Vice President; he was named the NHL Executive of the Year for the 2000-2001 season by the Hockey News. He now is Director of Player Personnel for the Dallas Stars. Taylor continues with his long-time Dave Taylor Golf Classic in Los Angeles, which benefits the Cystic Fibrosis Foundation. It is almost impossible in this era for someone to exclusively play 17 seasons with the same team in his career in the NHL like Taylor did from 1977-1994. Dave Taylor's number 18 was only the third number retired in Los Angeles Kings history. While videos of Dave Taylor's abilities on the ice, both scoring and fighting, are available on YouTube, young people who stutter will continue to be inspired by Taylor's never-ending triumphs over the odds. His enthusiasm and dedication will never be retired.